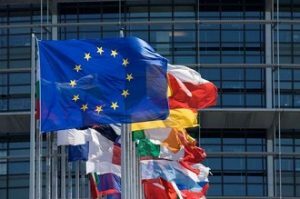 The last Eurobarometer of the European Parliament, published in September, shows that 49% of Romanians consider that EU membership is a good thing. Compared to the previous April survey, the percentage drops by 10 points, which is the highest decrease at the EU level. “Overall, at the European level, the support for the EU grew significantly following the UK referendum in 2016, which suggests both the growing Europeans’ concern about the impact of Brexit and an increase in the awareness of the benefits of the EU membership, due to the difficult negotiations for the UK’s exit from the EU,” reports Eurobarometer data. In the event of a referendum on the EU membership, 66% of Europeans (65% of Romanians) would vote for their country to remain a member. 17% of the Europeans (15% of Romanians) would vote for leaving the EU, while 17% of the Europeans (20% of Romanians) say they do not know how to vote. The survey data show that 49% of the Europeans (51% of Romanians) are satisfied with the way democracy works in the European Union. 32% of the Europeans (43% in Romania) have a positive perception of the European Parliament, 21% (17% in Romania) have a negative perception, while 43% of the Europeans (36% in Romania) have a neutral perception. 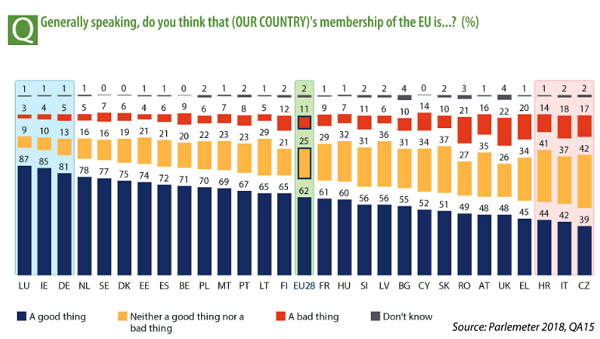 48% of the Europeans (63% in Romania) would like the European Parliament to play a more important role. The level of information and the interest in the European elections in 2019 are rising: 41% of the Europeans, compared to 32% in April 2018 (53% of Romanians compared to 43% in April 2018) correctly identified the month of May next year as the period when elections will be organised, while 51% of the Europeans, compared to 50% in April 2018 (57% of Romanians, compared to 55% in April 2018), express their interest in these elections. Regarding the themes they want to be discussed in the electoral campaign, Europeans identified the following priorities: immigration (referred to by 50% of respondents), economy (47%), combating youth unemployment (47%), combating terrorism (44%) and environmental protection (40%). The priority themes identified by Romanians are economy (53%), fighting youth unemployment (44%), promoting human rights and democracy (38%), consumer protection and food security (36%) and social protection (35%). The survey was conducted by Kantar Public between 8-26.09.2018, through a face-to-face interview method, on a sample of 27,474 people at the European level (1,007 in Romania).